This was our first cruise and we were part of a group of 8. I loved our cabin, it was fine for the two of us and the room steward was excellent, really helpful and friendly We booked the drinks package which was a mistake because we both like good wine and the wine included in the drinks package was poor. I tried to find out from MSC before we left which wine was in the drinks package but they could not tell me! The entertainment onboard was boring, same old songs over and over again in the bars. We went to the disco one night and there were only about 5 people in there but the DJ refused to play any of our requests! The gym has amazing views but every time I went at least 2 of the machines were out of action so sometimes you had to queue.. I booked the spa package and it is beautiful but quite a small area so once again you had to go at quiet times. We though the buffet food was good because there is a big choice so we could always find something we liked. 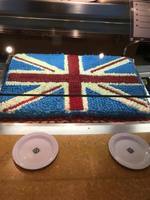 There was a royal wedding while we were onboard and they served an amazing Union Jack wedding cake in the buffet. The breakfast service was usually busy but there was always plenty of choice and the staff were helpful. The dress code seemed to be fairly casual which suited us. Embarkation and disembarkation were easy and smooth. 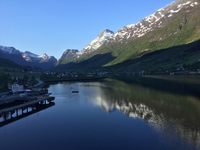 The best thing about this cruise was the stop offs, we loved Norway and we found lots to do. We didn&apos;t book any of the excursions offered by the cruise line as we booked our own activities. In Bergen we went to the Greig museum in Troldhaugen, we booked it in advance through the Tourist Office and it cost about £23 but absolutely worth every penny it is such a beautiful place and they have a lunchtime piano concert which was magical, In Olden we got the local bus to the Briksdal glacier which cost about £4. The bus stops just to the left of where you disembark from the ship. It was very easy and the bus driver spoke perfect English. There is a 40 minute walk from where you get off the bus to the actual glacier but they have got little Troll buses. We walked as it was such a beautiful day. 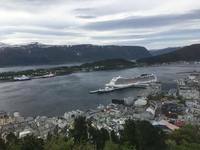 In Alesund we walked to the Fjellstua Viewpoint, a climb up 417 steps and we also visited the museum which was small but fascinating, especially the Uraed which was first enclosed lifeboat to cross the North Atlantic. You can actually sit inside it. In Stavanger we booked a Fjord cruise to Lysefjord & Pulpit Rock, it cost about £40 per person and the departure point was just minutes from where the ship docked. Ii was well worth doing and much cheaper than the one offered by the cruise company. It was also Norway day when we were docked in Stavanger so there were parades and parties in all of the bars. In Hamburg we booked a history tour in the morning with Robin and the tour guides which was free, well you pay the guide whatever you want. The guide was very entertaining and knowledgeable. In the afternoon we went on a guided Hamburg bike tour which we booked in advance, it cost about £23 each and they supply bikes and a guide. You get to see a lot of Hamburg this way. We still had time after all of that to visit a few bars in Hamburg before getting back on the ship. MSC offer a shuttle bus service to the centre of Hamburg for 14,90 euros each but we just got on the local bus which cost about 2 euros to the centre. This was our first cruise and we were part of a group of 8. We booked the drinks package which was a mistake because we both like good wine and the wine included in the drinks package was poor. I tried to find out from MSC before we left which wine was in the drinks package but they could not tell me! The entertainment onboard was boring, same old songs over and over again in the bars. We went to the disco one night and there were only about 5 people in there but the DJ refused to play any of our requests! The gym has amazing views but every time I went at least 2 of the machines were out of action so sometimes you had to queue.. I booked the spa package and it is beautiful but quite a small area so once again you had to go at quiet times. We though the buffet food was good because there is a big choice so we could always find something we liked. There was a royal wedding while we were onboard and they served an amazing Union Jack wedding cake in the buffet. The breakfast service was usually busy but there was always plenty of choice and the staff were helpful. The dress code seemed to be fairly casual which suited us. Embarkation and disembarkation were easy and smooth. In Olden we got the local bus to the Briksdal glacier which cost about £4. The bus stops just to the left of where you disembark from the ship. It was very easy and the bus driver spoke perfect English. There is a 40 minute walk from where you get off the bus to the actual glacier but they have got little Troll buses. We walked as it was such a beautiful day. In Alesund we walked to the Fjellstua Viewpoint, a climb up 417 steps and we also visited the museum which was small but fascinating, especially the Uraed which was first enclosed lifeboat to cross the North Atlantic. You can actually sit inside it. In Stavanger we booked a Fjord cruise to Lysefjord & Pulpit Rock, it cost about £40 per person and the departure point was just minutes from where the ship docked. Ii was well worth doing and much cheaper than the one offered by the cruise company. It was also Norway day when we were docked in Stavanger so there were parades and parties in all of the bars. In Hamburg we booked a history tour in the morning with Robin and the tour guides which was free, well you pay the guide whatever you want. The guide was very entertaining and knowledgeable. In the afternoon we went on a guided Hamburg bike tour which we booked in advance, it cost about £23 each and they supply bikes and a guide. You get to see a lot of Hamburg this way. We still had time after all of that to visit a few bars in Hamburg before getting back on the ship. MSC offer a shuttle bus service to the centre of Hamburg for 14,90 euros each but we just got on the local bus which cost about 2 euros to the centre. Lovely cabin, very comfortable bed and pillows. Excellent room steward. We climbed up 417 steps to the Fjellstua Viewpoint, it was a bit windy so it was a tricky climb , I literally was nearly blown over but amazing views at the top. We also visited the little Alesund museum which I thought was interesting. The Greig museum is definitely worth visiting, The guide was excellent and it is such a beautiful place. Listening to piano music while looking across the lake is a magical experience. the bus leaves the tourist office at 11am. It cost about £23 each. Brilliant historical tour of Hamburg centre, our guide was entertaining and knowledgeable. We caught the local bus to the Briksdal glacier. The bus stops just to the left of where you get off the ship. It cost about £4 return each. When you get off the bus there is about a 40 minute walk to the glacier, it is quite an easy walk and very pretty with quite a few goats lounging around. Little or no respect for passengers' health or health and safety.